For some reason this cute little orecchiette pasta shape was just calling my name. 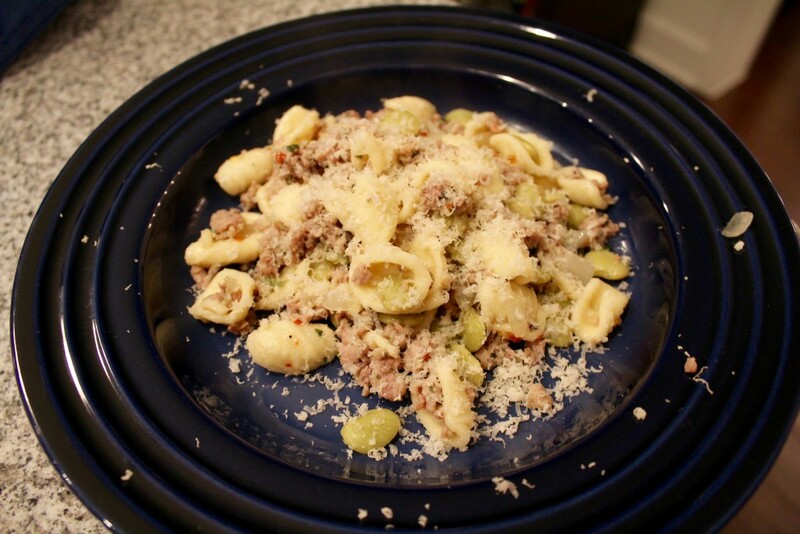 I had a surplus of turkey sausage from an overzealous grocery trip, and voilà this recipe was born. This dish is simple and comforting. It comes together very quickly and is ideal for an easy weeknight dinner. And although I sort of made up this recipe, it feels very authentic. Orecchiette is a kind of rustic pasta, from the Apulia region in Italy (in the boot of the country). This area is well known for making homemade pasta but it is very different from the pasta you are most likely accustomed to that is made in Emilia-Romagna. 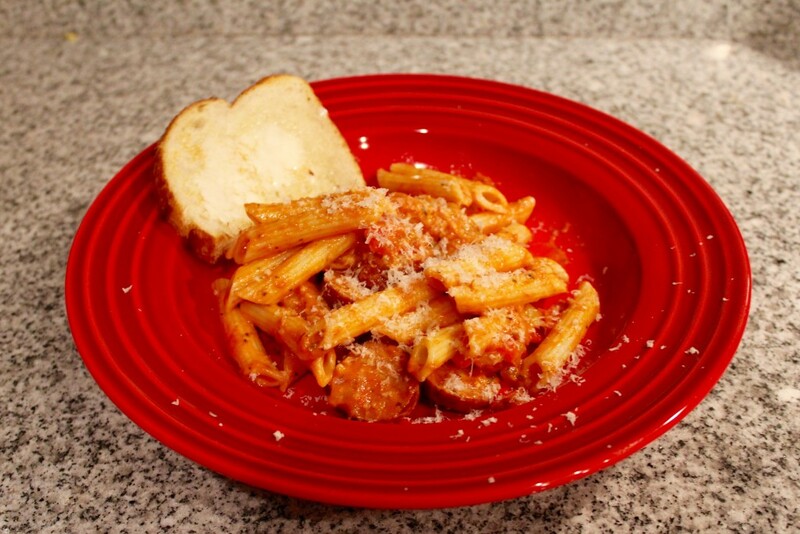 It is a firmer pasta and it is actually very simple to make. I recommend Marcella Hazan’s book if you’re interested in making your own pasta. 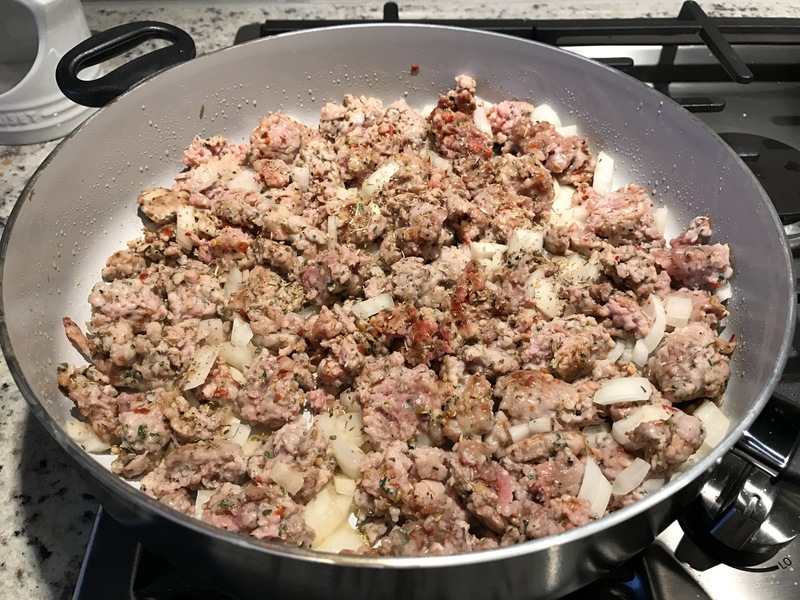 I like to use Fresh Market white wine and garlic turkey sausage in this recipe, it has excellent flavor and is a bit healthier than traditional pork sausage. If you make the recipe as directed below, you will get about 4 servings of 520 calories each. This is pretty good, I think, for a pasta dish with sausage. 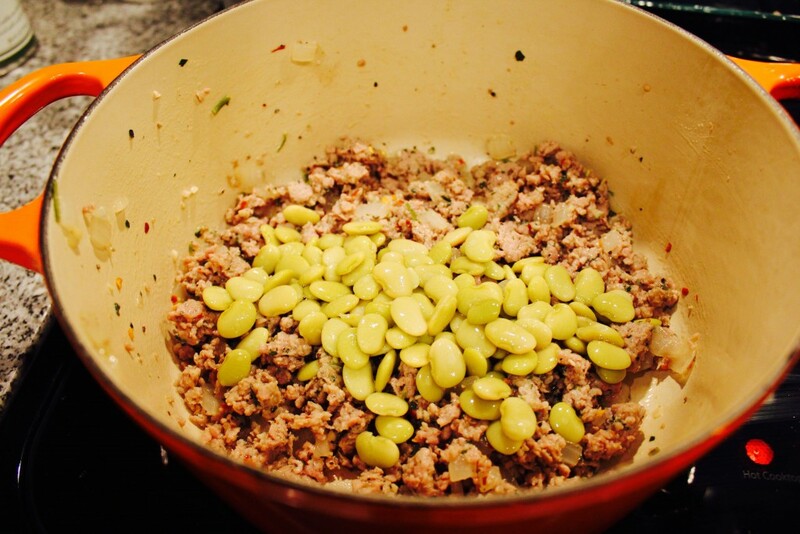 You could actually substitute the lima beans for other greens that you may have in the fridge. I have used kale and spinach in this recipe. You should cook the kale and spinach down with the onions and garlic though. It will only take a few minutes. Serve this with white wine, a steel chardonnay or pinot grigio. One of my new favorite everyday chards right now is Bouchaine. They have a lovely wine made in Carneros that is sold at Costco for the extremely reasonable price of $16. It is actually the oldest operating winery in Carneros. It has changed hands a few times over the years and now produces fabulous chardonnay and pinot noir with sustainable farming practices. You will definitely appreciate the Burgundian style but the California notes and Carneros terroir are recognizable in this wine. Cook orecchiette as directed on the package in a large pot of boiling water until it is al dente. While the pasta is cooking, heat a large skillet over medium heat. Cook the sausage, breaking it up with a firm spatula until only small clumps remain. Remove the cooked sausage to a plate. Add 2 tbsp extra virgin olive oil to the skillet. Sauté the onion for 5 minutes until translucent. Stir in the minced garlic and red pepper flakes, cook for 1 minute longer. Remove from heat, return the sausage to the pan. Add in the lima beans. 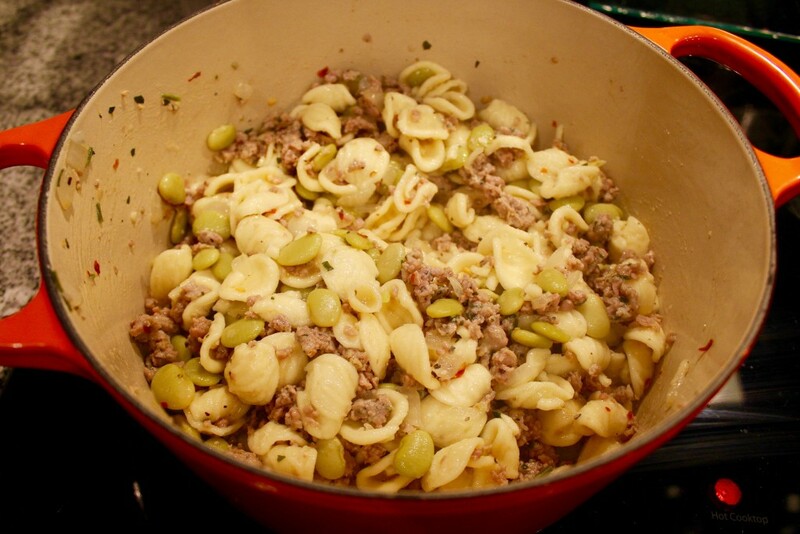 Toss the cooked orecchiette with the sausage and onion mixture. Sprinkle with salt and pepper, taste and adjust seasonings. Mix in the grated parmesan cheese. I am so excited about this pasta. 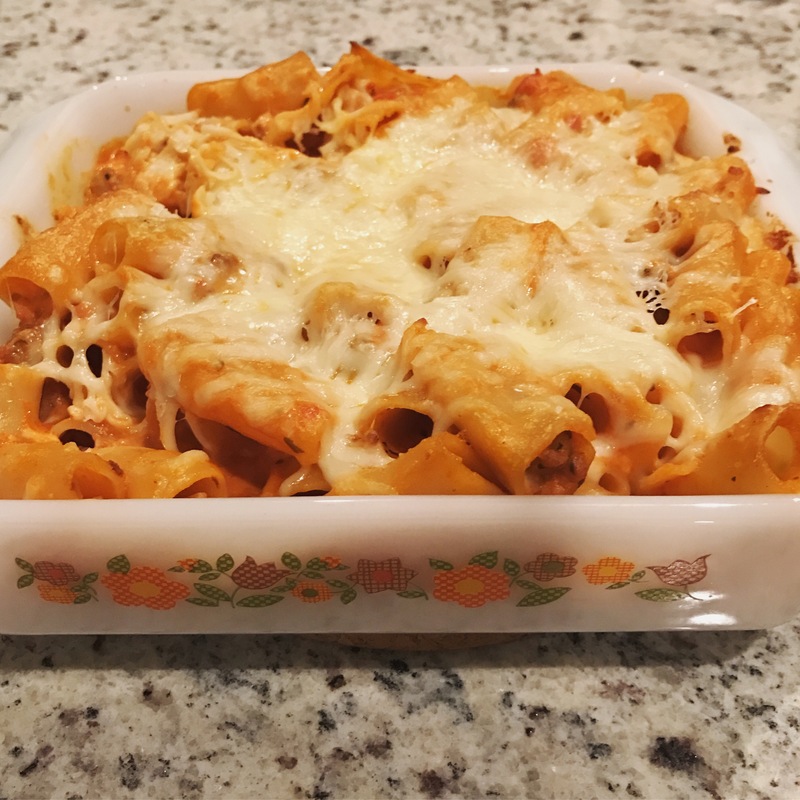 It is a dish that will impress your friends but it also comes together quickly for a weeknight meal. I debuted this recipe at a Bachelor watch party and it was a huge success. There, the secret is out. The Bachelor is an amazing show. It is almost as amazing as this Cajun Pasta. This dinner is easy, it’s exploding with flavor, it’s spicy, and it’s comforting. It will help you get through the rollercoaster of emotions that is The Bachelor. If you do not have a Bachelor bracket competition going with your friends, I really don’t understand what gets you out of bed on Monday mornings. It’s getting a little late in the season to start brackets, but it’s never to late for Bachelor bingo. I have created for you… a very special bingo game. So print off these bingo cards, invite your friends over, pour yourself a glass of wine, make some Cajun Pasta, and Monday night will soon be your favorite night of the week. You can use any of the produce in your fridge for this recipe. If you have Italian sausage, use it, if you have andouille, use it. If you have chicken or shrimp, use it. If your shrimp is already cooked, easy, throw it in the sauce at the end of cooking. If you want to add some kale or spinach, cook it down with the onions and red pepper before you add the tomatoes. If you don’t have a can of San Marzano tomatoes, use a jar of marinara. Seriously. This is a very forgiving recipe. 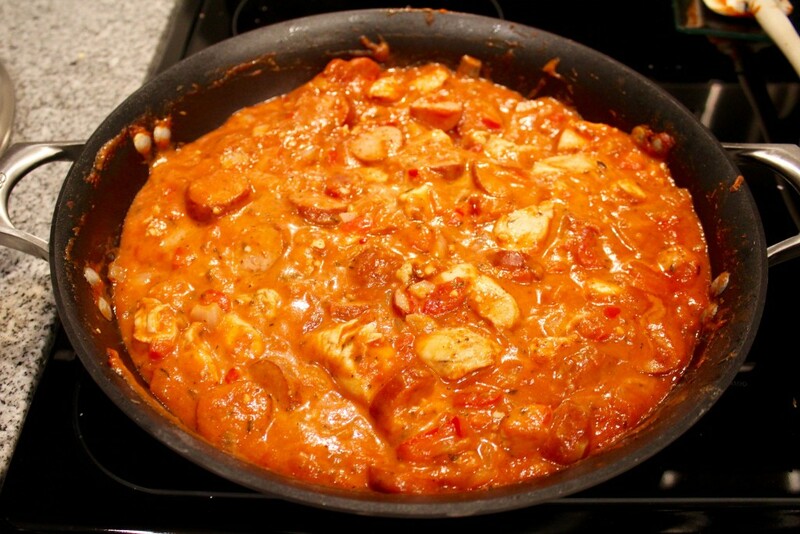 I like to use Johnsonville andouille chicken sausage in this recipe to save on calories. It has wonderful flavor, it’s spicy, and it’s half the calories compared to pork. But again you can definitely use pork or turkey sausage, whatever you can find in the store. This meal is about 450 calories for each of 8 servings. Which is truly phenomenal considering how delicious and comforting it is. I do have to admit that I use a secret ingredient in this. I include a spice blend called Cape Hatteras Smoked Seafood Seasoning. It is from a store in Brookside, Savory Spice Shop. I have been using their spices for awhile now, and I have not been disappointed. You can visit the shop or you can order online. My other favorite spice from their store is the black lava salt. It is a black smoky sea salt that will elevate any dish, dessert, or cookie. In place of the Cape Hatteras blend, you can use any cajun seasoning that you prefer. This pasta is a bit spicy which may lead you down the white wine road. But I think you should serve this dish with Nebbiolo. This grape comes from the Piedmont region in Italy and is mostly used in Barolo and Barbaresco. I am so glad that Nebbiolo is gaining in popularity. It is a lighter bodied wine but has complex tannins that will surprise you, for sure. This grape only composes about 3% of the Piedmont region’s production. It is gaining in popularity but it is not super prevalent in US retailers. You may have to search for this wine. If you have access to Costco, they have two excellent Nebbiolos right now. It is a perfect red wine to serve with tomato based sauces and spicy foods. Cook the pasta as directed on the package in a large pot of boiling water. Heat olive oil in a large skillet over medium heat. Season the chopped chicken with cajun seasoning, salt, and pepper. 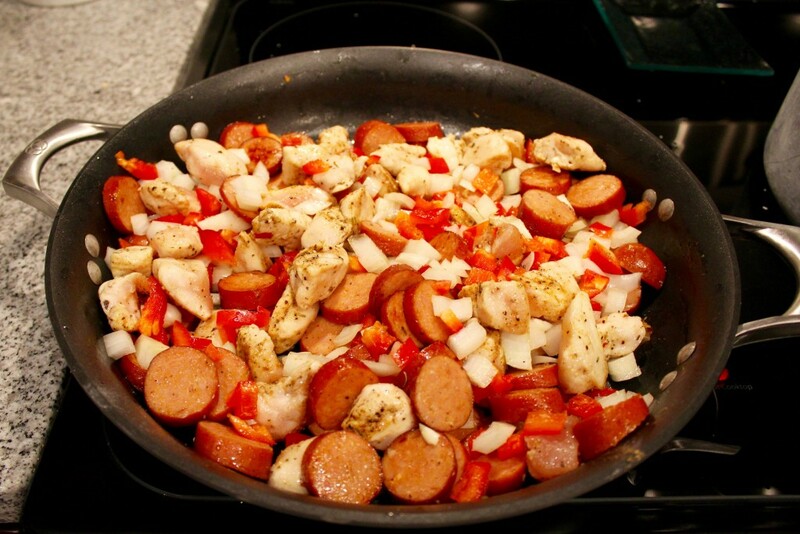 Cook the sausage and chicken breast tenders in the olive oil for 7 minutes. The chicken should be just cooked on all sides. Mix in the onions and bell pepper. Sauté the vegetables and meat over medium heat until the onions are translucent and the pepper softens. Add in the garlic, thyme, oregano, cayenne pepper. Cook for 2 minutes more until the spices and garlic are fragrant. Deglaze the skillet with white wine. 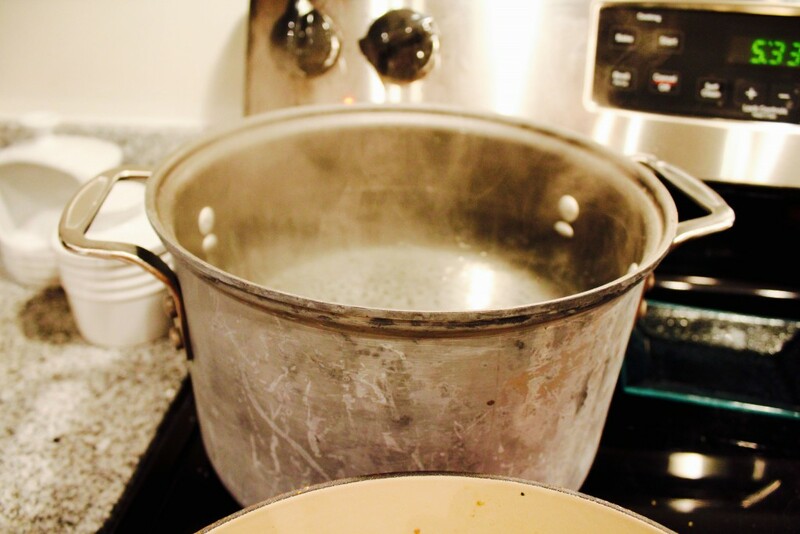 Cook until most of the wine evaporates, about 5 minutes. Add in the crushed san marzano tomatoes with their juices. Stir to combine well. Simmer the sauce, partially covered, over medium low heat, for 10 minutes. Mix in the shrimp and cook for 5 minutes more, until the shrimp is just pink. Taste the sauce, adjust seasonings with salt and pepper. Stir in the cream. Toss the pasta with the sauce. Serve topped with freshly grated parmesan cheese.